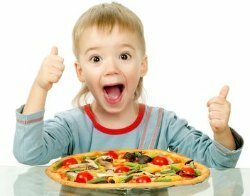 As children get a bit older a Kids Pizza Party can be a great option for birthdays, sleepovers or other excuses to have a good time. There are very few kids (or adults) who don't like pizza. They are quick and easy to make and bake and they can be put together in endless varieties and combinations. Some people will prefer to buy ready-made plain pizza bases. These are cheap, easy, uniform and ready to go. More adventurous parents and ones, we suggest, not dealing with too many young "pizzaristas" at once, may wish to include making the pizza bases in the party also. Pour 500ml tepid water into a bowl and mix in the yeast, olive oil and honey. Use a fork to whisk until dissolved. Mix the flour and salt in a bowl and add the dissolved yeast mix. Either mix with a food processor using a dough hook attachment with a last minute or two of hand kneading or you can work on a floured work surface mixing in and kneading by hand from scratch. When the dough is smooth and elastic place in a greased bowl and cover with clingfilm. Leave in a warm place to prove until doubled in size (usually about 45 minutes). Parents might prefer to get the dough to this stage themselves before handing over to the children. With the palm of their hands get them to flatten their dough. You may like to demonstrate the traditional Italian pizzeria method where the dough is spun around on one hand………….on the other hand you may not!! Get each child to place their flattened base on a baking tray brushed will oil and dusted with more flour or polenta. If you lack baking trays place on a plate for transfer later. Many pizzas start with a tomato base of some kind. This is easily prepared. Method: Heat the tomatoes gently in a pan until reduced (about 15 - 20minutes) before adding the other ingredients and cooking in for a further 5 minutes. Leave to cool before allowing the kids to smear sauce on their bases. The whole point of a great kids pizza party is having fun putting together the right combination of toppings to make the perfect pizza. This is what children like - the chance to be in charge, to be creative…and…of course… to be a bit over the top with their toppings! Try to rein in the kids enthusiasm to keep on adding toppings or you will end up with some very fat soggy pizzas that may not cook properly. You may like to set a limit. Use a hot pre-heated oven around 220 - 230 degrees C. The pizzas will take between 5 - 10 minutes to cook (but keep your eye on them). Its easy to squeeze a bit of extra juice out of you party by pitting the young pizza chefs against each other. Get them to give their creations a cool name such as "The Scrumptious Salami Special", "Ralph's Rasher and Rocket", "Julie's El Magnifico" Give a little help if needed. Then line up all the pizzas and using a scorecard system get them to give each offering a mark out of 10 for name, appearance and taste. You may like to tell the kids to keep their scorecards secret, and, of course, no one can mark their own. Total the marks to arrive at the Champion Pizza. This is a kids pizza party variation on musical chairs. In advance cut out a number of large card circles and decorate as pizzas. These are placed on the floor (you may need to stick down with tape. As music plays the children skip around the pizzas but when it stops they have to quickly sit on one to become a topping. One child per pizza. After a couple of rounds start removing a pizza each time so that a child is out. Continue until you find your "Champion Topping"! This one is suitable at a kids pizza party for older children. Give each child or pair of children a piece of paper with the words: Margherita Pizza at the top. Then give the children 5 minutes to come up with all the words they can using only letters from the title. This is a great game if you have the space outside. In advance of your party buy some cheap plastic frisbees. Paint pizza designs on to them with acrylic paint. You could even give them aeronautical names such as the "Calzone Comet" the "Romana Rocket" or the "Flying Formagio". You could have the kids simply throw the flying pizzas to each other increasing the distance each time a successful catch is made. Another neat game however would be to cut a large cardboard circle (painted white) and place it on the ground. The kids then have to try to land their flying pizzas on the plate. This fun game is perfect for a kids pizza party. Sit all the kids on chairs in a row. Place a slice of cucumber on the forehead of each child. On the word go all the children have to wriggle and contort their faces to try to get the cucumber to slide down into their mouth. No hands allowed, if the cucumber drops off they have to start from the top again. As the cucumber gets near their mouths they can try to use their tongue to help. First kid with the cucumber in their mouth wins. This game is very funny to watch. Make sure you have a camera handy.